Having sod installed in your front yard is an important step here in Orlando. You are not only making your yard look amazing; you are doing it in record time. Under any other circumstances, it would take years for your grass to grow and for you to get the lush, green lawn that you truly desire. 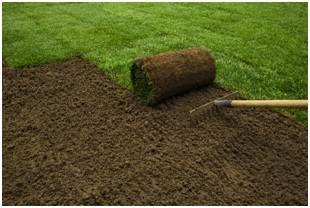 Sod rolls cut that time down significantly, making it easy to build a foundation for your brand-new landscaping project. Residential and commercial property owners can quickly move onto the hardscaping portion of their lawn makeover, and while all your features might look great in the daytime, you should also consider what it’s going to look like at night. If things don’t look as spectacular in the dark as they do when its light, it’s time to get to work on lighting. Nighttime affords you an opportunity to show off your landscape in an entirely different way. A well planned and configured lawn is something to see by daylight,but at night you can really get your imagination going. Many homeowners make the mistake of simply throwing up a few lampposts here and there, hoping that will cover the entire space and while you could place a few lampposts intermittently through your yard, only doing this is wasted opportunity. When you install lighting in your yard one of the things you want to do is make sure that instead of a solid blanket of illumination across the board, you have pools of light that highlight specific areas. By using pools, such as those emanated by well lights, you create focal points that draw the eye. You can start at the driveway and draw the eye of your visitor across the yard, stopping on certain aspects throughout the hardscaping. Maybe you want them to rest their eyes on a fountain or draw their attention to the retaining wall. Lighting is more than illuminating – it’s telling a story through your landscaping, and that’s not always easy to do. You already know the value of installing sod on your Orlando property, and that means you’re out to save money. One of the best ways for you to do that is to start using energy efficient bulbs. Take LED or Light Emitting Diode lights as your primary example. While they are much more expensive at the outset if you’re going to go all out with your landscaping, you might as well spare no expense here, and it will save you some serious money in the long run. As you go green with your sod installation, there should be no doubt in your mind that LED’s are a great way to bring your landscaping project to the next level. While LED lights are the preferred method of lighting your yard, you should also consider halogen bulbs for floodlights among other things. 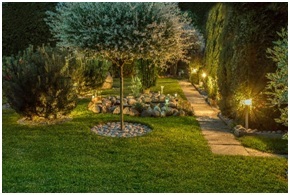 To fully bring out the best in your lawn, there are a few different types of light fixtures that you will want to employ, starting with well lights which are inset in the ground and illuminate certain areas of your landscape evenly. Bullet lights, on the other hand, are more directional and can draw attention to a specific aspect of the landscape. Using the proper combination of bullet, spotlights, and flood light sis essential if you want to showcase your lawn which makes it imperative that you don’t just place lights at random; rather call the professionals. Our experienced professionals can evaluate your lawn and determine not only how to best lay sod, but also how to install an irrigation system and map out a lighting solution to show off the investment you made in an entirely different way once the sun goes down. Your lawn has two different faces: the one it shows during the daytime, and the one that everyone sees at night. That is two different ways to make a first impression and two ways to get the aesthetic you want. Call us today and let us help you to optimize your lawn and your landscape lighting.